2-piece set includes full size backpack plus coordinating lunchbox that attaches to the front of the backpack with velcro close straps. 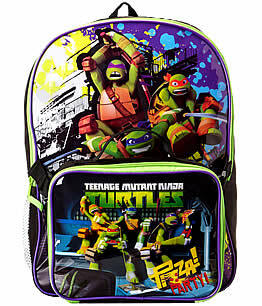 Both are material (canvas feel) back and sides with a Ninja Turtles plastic front design. Backpack has a zipper closure, adjustable straps, and an open mesh pocket on one side. Lunchbox is plastic lined and insulated with a zipper closure and material carry handle on top. Lunchbox is a about 3/4 the size of a standard lunchbox; please note the dimensions below. Backpack approximately: 11.5" wide x 15.5" tall x 4.75" deep. Lunchbox approximately: 9" wide x 7" tall x 2.75" deep.